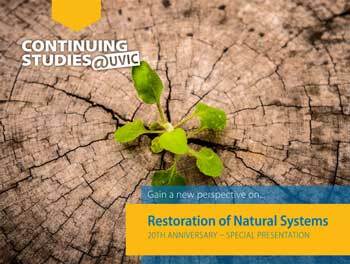 An evening with Briony Penn: 20 Years of Restoring Hope, a Celebration of the Restoration of Natural Systems Program. A free lecture at UVic David Lam Auditorium, MAC A144 on Oct 14, 2016 at 6:30. "Briony will speak about the importance of ecological restoration and her experiences in the field over the last 20 years. Briony gave a talk at the Helping the Land Heal conference in 1999 and she will reflect on what we hoped for and where we are now. She will also talk about her experience with the RNS Program, offering some anecdotes from the courses she taught and the importance of ecological restoration in general, especially the need for a holistic approach that is led by traditional ecological knowledge and informed by social sciences, rather than focusing only on natural sciences. She will also describe some of her own project experience in ecological restoration." Briony received a national Environment Learning award from Canadian Geographic in 2003.